javax.net.ssl.SSLKeyException: [Security:090482]BAD_CERTIFICATE alert was received from<Hostname>- <IP Address>. Check the peer to determine why it rejected the certificate chain (trusted CA configuration, hostname verification). SSL debug tracing may be required to determine the exact reason the certificate was rejected. WARNING: Uncaught exception in server handlerjavax.net.ssl.SSLKeyException: [Security:090482]BAD_CERTIFICATE alert was received from <Hostname>- <IP Address>. Check the peer to determine why it rejected the certificate chain (trusted CA configuration, hostname verification). SSL debug tracing may be required to determine the exact reason the certificate was rejected. javax.net.ssl.SSLKeyException: [Security:090482]BAD_CERTIFICATE alert was received from <Hostname>- <IP Address>. Check the peer to determine why it rejected the certificate chain (trusted CA configuration, hostname verification). SSL debug tracing may be required to determine the exact reason the certificate was rejected. So firstly I checked the server address (/etc/hosts) and changed the Listen Address of Node Manager with the server address defined in hosts file (also reported in log file). 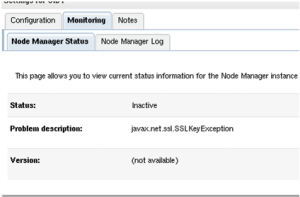 After changing Node Manager listen address I could see status as active for Node Manager in WebLogic Server.